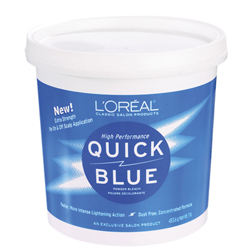 L'OREAL TECHNIQUE Quick Blue is a fast and effective high-performance powder bleach. Very easy to use. Tub 1 lb. 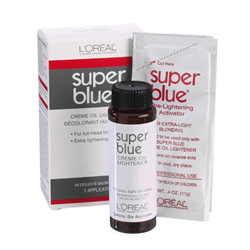 L'OREAL Super Blue is a creme oil lightener used to achieve extra-light blonding. Built-in drabber helps eliminate red, gold and brassy tones. 1 appl. 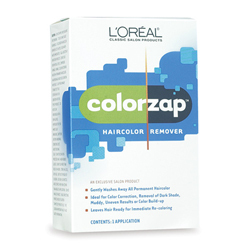 L'OREAL Colorzap Color Remover Kit removes unwanted dark shade, color build-up, muddy or uneven results. Leaves hair ready for immediate re-coloring. 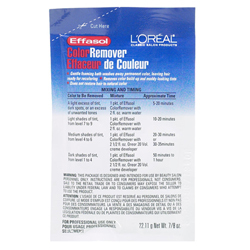 L'OREAL Effasol Permanent Haircolor Remover washes away permanent haircolor, leaving hair ready for recoloring. Packette 7/8 oz.